Bring This Hunting Lioness Home to Your Collection! Few animals conjure up immediate awe quite like the African Lion. These larger-than-life felines appear gentle and playful at first glance, but can strike with enormous ferocity if threatened or interrupted while looking for their next meal. And while the male, with his iconic, gorgeous mane, usually takes center stage, it's the smaller, sleeker lioness that is the strategic hunter of the family. Prowling the savannas and plains in groups, female lions will bring down wildebeests, antelopes and zebras to feed their pride. Without a seasoned guide, coming up on one of these hunting parties in the wild could make you a quick appetizer indeed! Yet, with respect, distance, conservation and vigilance, we can enjoy these majestic animals for what they are -- vital elements of a rich environment. A "circle of life," perhaps. (Where did we hear that one before?) So, when we saw these gorgeous and reverent African Lion Proofs issued as legal tender by a country in the very heart of Africa itself, we fell in love immediately! 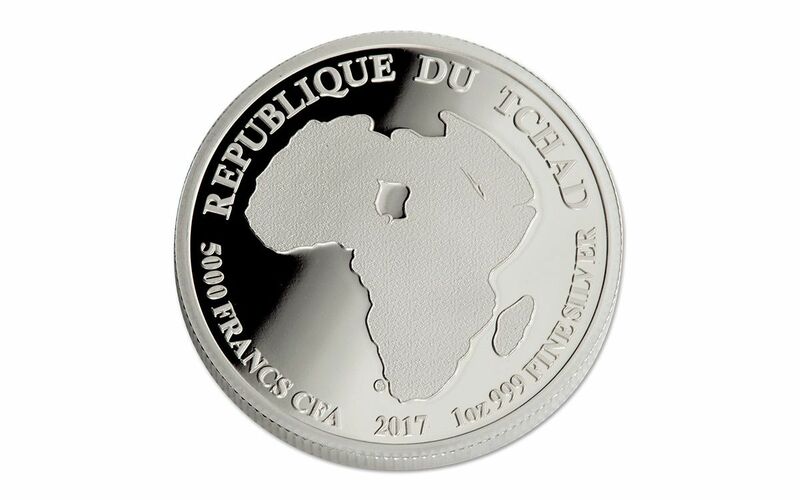 Struck in one ounce of 99.9% pure silver, each of these 2017 African Lion Proofs is legal-tender 5,000 Francs CFA for the Republic of Chad. Specially-polished planchets and repeated strikes produce fascinatingly distinct details that rise over shimmering mirrored fields. One side of the proof shows a skillfully-engraved depiction of a lioness walking through the grass with a focused gaze, while the other side wreaths the coin's details around an illustration of Africa. Your 2017 Silver African Lion Proof will also come with several additional features fit for the king and queen of beasts! 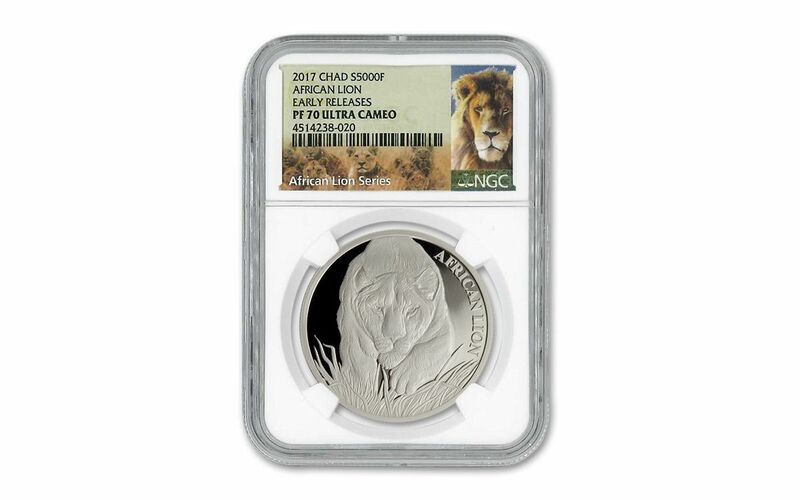 Your coin will be graded Proof-70 (PF70) by Numismatic Guaranty Corporation (NGC), a distinction that means your perfectly-graded 2017 Silver African Lion Proof will have ZERO imperfections -- showing all features and fields exactly as the engraver and mint intended! 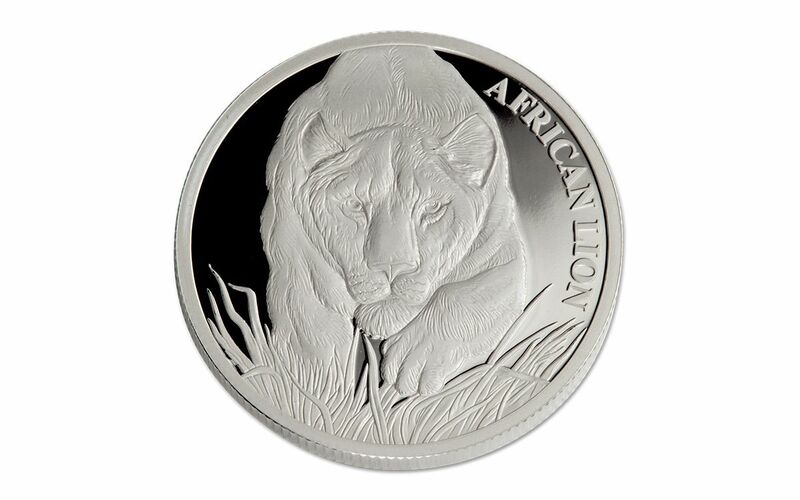 Your 2017 Silver African Lion Proof will also be certified Early Releases (ER) by NGC, meaning that it was among the first struck by the mint and was certified within the first 30 days of issue. Collectors seek out these proofs because they are produced with new dies and considered to have sharper strikes and deeper mirrors than those that are stuck later. Your proof will be sonically sealed in an acrylic case with a white display core -- giving you the best in protection while granting clear sightlines into every beautiful detail. 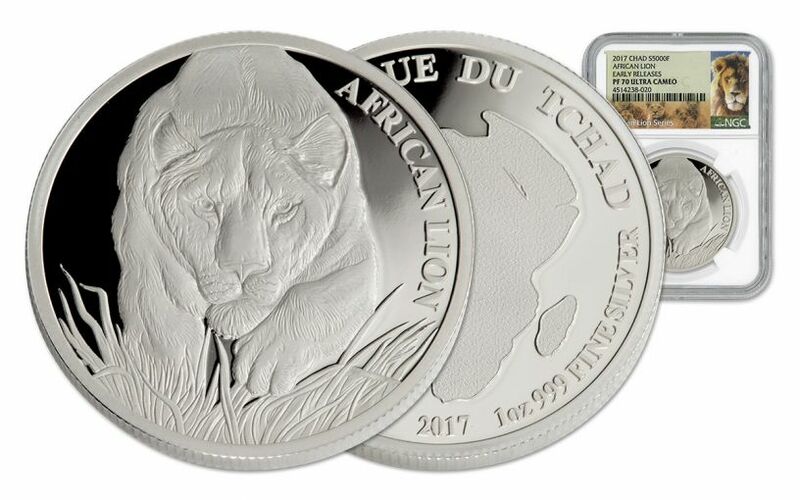 All of your 2017 Silver African Lion Proof's unique characteristics will be described in detail on the acrylic case's label, which also features images of both a majestic male lion and a field full of adorable lion cubs! You'll also receive all of the original mint packaging, including a certificate of authenticity and a specially-crafted wood presentation box. With a total mintage limited to only 1,000 proofs, and considering the popularity of animal coins among collectors, time is not on your side! Don't wait another moment to capture one of these beautifully minted proofs for your own. Get your order in today!